The Socioeconomic Politics of Babywearing – I have been thinking a lot about this topic in the last few months, and have been slowly jotting down notes for a future article. So far, the moms and dads who have submitted stories and moments haven’t commented on their socioeconomic status as relevant to their Babywearing experience (though regardless of whether or not it is acknowledged, it is always present). I was thrilled when today’s mom mentioned this topic in her story. I am looking forward to hearing readers thoughts on this topic, which I hope to continue to discuss in depth throughout the coming weeks. 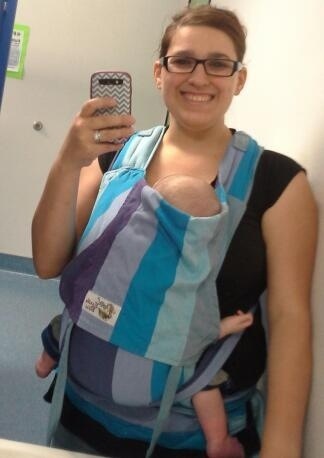 Who: I am 22 years old married mother of two with two college degrees wearing my three month old while nursing at a indoor play gym with my two year old. (I feel the above statement is showing that mothers of all ages and education backgrounds baby wear. Not just poor and uneducated which people infer about me as to say that I cannot afford a stroller so I must use a bed sheet). Why: I am baby wearing at this moment so that I can play with my older son but still be close to my baby. It allows me to be hands free and run around. I baby wore my first due to colic and now so that I can care for both children at the same time. I live in Mexico, and babywearing has a deep socioeconomic and cultural connotation here. For the longest time, it seemed like only poor, indigenous women wore their babies, and in low socioeconomic classes, owning a stroller is seen as a status symbol. In recent years, however, and thanks to the huge efforts many babywearing and attachment parenting groups have made to educate the general public, babywearing is becoming fashionable again. More middle, upper class, and even local celebrity mamas are starting to wear their babies, and this is having a positive impact on how it is perceived. What most people don’t realize, is that many times, wraps are so much more expensive than a stroller! You can make your own of course which I have for a fraction of the cost, but only someone who doesn’t know the financial cost would think that your baby wear because you can’t afford a stroller. It is amazing to me how we as people are so fast to jump to conclusions about other people.